Truth & Dare, an anthology of short stories about ‘love, life and falling on your face’, is edited by Liz Miles and available soon on both sides of the Atlantic. If you’re on Facebook, check out the playlist on the Constable & Robinson page, compiled by all the contributing authors, including me! My story in the anthology is called “Cool Cats and Melted Kisses“. View the Truth & Dare playlist. 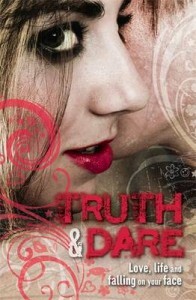 Truth & Dare is a collection of short stories confirming the truth we all know– high school is painful–and written for those who dare to be different. These edgy short stories are told from the point of view of the quirky, cool, but not necessarily popular teens, who are dealing with all the pressures of growing up–school, friends, music, relationships, parents, and just plain fitting in. This collection features some of the hottest writers in the teen genre, including: Jennifer Boylan, Sarah Rees Brennan, Cecil Castellucci, Emma Donoghue, Courtney Gillette, A.M. Homes, Jennifer Hubbard, Heidi R. Kling, Jennifer Knight, Michael Lowenthal, Liz Miles, Saundra Mitchell, Luisa Plaja, Matthue Roth, Sherry Shahan, Gary Soto, Shelley Stoehr, Sara Wilkinson, Ellen Wittlinger, and Jill Wolfson.